No review on these (YET) but I thought I'd share. ORLY and ColorBlast by ORLY is a brand I've had good luck with in the past. I didn't know that Quo has done a partnership with ORLY but it must have lunched in the past 4 weeks since I has last visited a Shoppers. 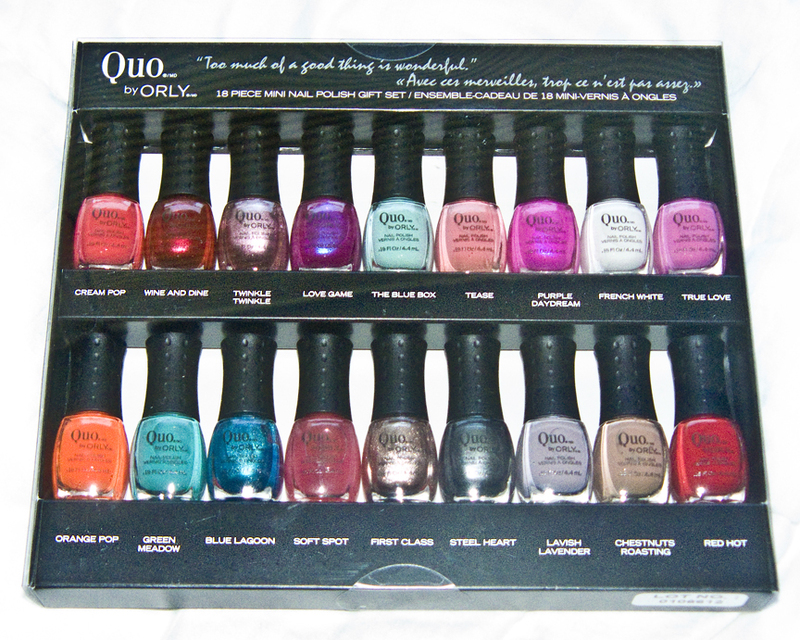 the Quo by ORLY line retails for $10 a bottle and is on pare with Nicole by OPI ($9.99) and Essie ($12). This limited gift set retail for $42. I was a bit hesitant to buy it at first but thinking it over this collection had about half of the shade from their permanent line to try out and about 5 i really wanted to get. The set consist of 10 Créme, 6 Shimmer and 2 Sheer formula shades. There are also 3 five piece sets for $18 each. I was eyeing the blue set for my next try. Currently the has a Neon collection out including a solid white base the look bright then the French White shade and probably black light reactive. The orange in this set is neon but not part of this neon collection. I also spotted one of my favorite shade of the ColorBlast by ORLY in Brilliant Shy repackaged for Quo by ORLY so double check what shades you do already have from ORLY first.